So I started working a doctors office where we continuously give Sq injects to patients (arms) and it seems like when I give them a lot of ppl say it hurts. Any advice ? I have tried pinching skin and going slow/ fast....does anyone have any advice for for me ? I feel unsure of my skills, and last thing I want to do is hurt anyone. RN&mom works as a Charge Nurse. Are you making sure to give them in the right places? I have seen nurses who were giving them on the wrong spots and that's why they hurt... I have given my son sub q injections for 10 yrs and all my pts say they never feel my shots. Good placement, a quick jab, and letting the alcohol dry for a couple seconds (wet alcohol will make it sting), are all tricks I've learned. If I think of more I'll let you know. It'll come with time. Good luck. I give SQ injections all the time in my anemia clinics and the key is pinch and placement. Make sure you are going in the side or underside of the upper arm. Also make sure you are using the right gauge/length needle. I use a 25g 5/8 inch. I'm in allergy, so it's sub q all day every day. Correct placement, pinch, and fast. It's not the stick they feel, it's the medication (or allergy extract) and there's not much you can do about that. We have shot patients as young as 4 and as old as 91 and some kids scream every time, some adults jump, some kids don't even budge, some adults ask if I've done their shot yet. Everybody's different. I use the one-handed technique. I pinch with my left hand. My right hand holds the syringe like a dart and after I insert the needle I use the right index finger to aspirate then push the plunger. Some nurses pinch, put the needle in, let go of the arm to hold the syringe with one hand and push the plunger with the other hand. Make sure you've got good subcu tissue. Oh, no matter how hard they argue with you, the 5/8" needle with proper technique did NOT go into their muscle. Why do you aspirate with subq injections? In fact, I read recently in one of the threads here on AN that aspirating for IM is no longer recommended by the CDC. Ayvah has 10 years experience and works as a RN. 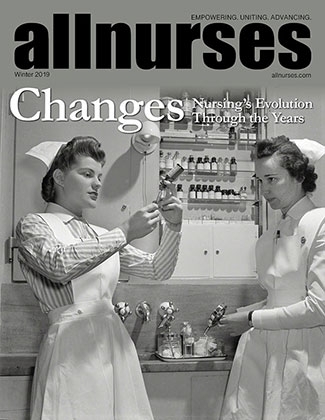 I have been surprised by the amount of threads on AN which nurses think no aspiration is necessary for sub-q or any injection, and saddened that this misinformation is spreading. CDC has not made this blanket statement. Follow only what trusted sources say: CDC, manufacturer's guidelines, and nursing texts. I'll copy what I posted to an earlier thread. Assume all IM (and YES including sub-Q) injections require aspiration unless you find otherwise. There are some exceptions of a few specific medications such as insulin and heparin and the flu shot which don't require aspiration. If you do enter a blood vessel (I have before on both an IM and a sub-q injection), blood will GUSH into the syringe. Capillary blood will be only a small drop/tinge in the syringe which does not gush in with sustained aspiration. Here is my proof regarding aspiration. As with all intramuscular preparations, Rocephin should be injected well within the body of a relatively large muscle; aspiration helps to avoid unintentional injection into a blood vessel. Release the skin pinch, keeping the syringe in position. Pull back slowly on the plunger. If blood enters the syringe, this means you have entered a blood vessel. Do not inject CIMZIA. Pull the needle out and throw away the prefilled syringe and needle in a puncture-proof container. Repeat the steps to prepare for an injection using a new prefilled syringe. Do not use the same prefilled syringe. Because there are no large blood vessels in the recommended sites, aspiration before injection of vaccines (i.e., pulling back on th e syringe plunger after needle insertion but before injection) is not necessary. Why are vaccines given the green light? I'm not sure but my guess is that they wouldn't be harmful to the body if given IV. If anyone else has info on why this is, I'd be interested in reading it! Also, if anyone has any updated trusted-source information which states contrary to the above I'd be interested in hearing that as well! give Sq injects to patients (arms) and it seems like when I give them a lot of ppl say it hurts. Any advice ? Like nurmac I always use counter pressure when withdrawing the needle. I keep the alcohol swab between the 4th and 5th fingers of my right hand. When I'm done injecting, I grab the swab with my left hand so I can place it over the wound as I withdraw the needle. Another thing I do is use my wrist to help dart the needle past the skin. I've watched so many (especially younger) nurses put the tip of the needle to the skin and then slowly drill it in. I'm not sure why it's taught that way, now. But I think the biggest reason shots hurt is because of whatever is being injected. For example, flu vac doesn't hurt, but MMR does.